Why pay 30 bucks to download a game from Steam when you could shell out ¥179,450 (Roughly US$1,760.76) for the Japanese package version? 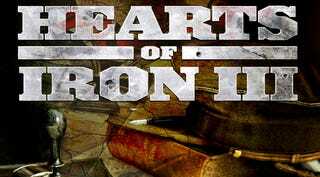 Hearts of Iron III is a grand strategy war game that was released in 2009. It's not an unremarkable game, but the current price on Japan's Amazon for its Japanese version has raised some people's eyebrows according to Japanese news website, The Page. The game's retail price is ¥13,800 (US$135.41) a touch pricey, although it does include the original game and 3 expansion packs. However, the ongoing price currently starts at ¥179,450 (US$1,760.76) for a new copy. Even used, the game goes for ¥110,000 (US$1,078.77). The reason for the jump in price is most likely due to the fact that the company that localized the game to Japan, Cyberfront, was shut down last year, making translated versions of the game difficult to come by. One used game retailer noted that while the prices have been escalating, they aren't as high as they seem to be on the internet. He also stated that "It's my impression that used Cyberfront games seem to sell quickly. I'm not certain whether people are buying them to play or to sell them online." It seems a little illogical to pay through the nose for the Japanese version of the game when one could pay a fraction of the price for the English version on Steam and use an unofficial patch to translate it. One 30 year old gamer speculated that "Perhaps some people feel hesitant to purchase the English download version of the game. It may cost more, but some people may want a physical copy of their own."